Healthy NewsWorks (HNW) empowers elementary and middle school students to become researchers, writers, critical thinkers, and confident communicators who advance health understanding and literacy through their factual publications and digital media. Since 2003, Healthy NewsWorks elementary and middle school students have encouraged healthful living by producing accurate, and relevant health publications and other types of media for their fellow students, families, and the wider school community. In the process, they deepen health awareness and understanding on such pressing issues as obesity, bullying, prescription drug safety, and asthma. Children learn how to gather reliable and relevant health information that they can report on in print, online, and through video and share with their schools and communities. Woven throughout the program are opportunities for students to gain writing and interviewing skills; to investigate, critically appraise and use health information; and to converse with medical experts, teachers, and community members. Read more about the newspaper program. Student journalists learn how to navigate and use health information and communicate it to the school community so others can benefit. Healthy NewsWorks focuses on a “special topic” each school year to provide more in-depth coverage and activities on important and relevant subjects such as prescription drug safety and heart-health. Like our newspapers, the Leading Healthy Change In Our Communities books are written and illustrated by our student journalists. Each book features 12 Philadelphia-area leaders who are making a difference in the health of our communities. The books are being read and distributed in classrooms, libraries, pediatric practices, and other school and community settings. Learn more about the book project. Started in 2003 at an Upper Darby, PA, elementary school, Healthy NewsWorks began as a collaboration between journalist Marian Uhlman and second grade teacher Susan Spencer. Healthy NewsWorks offers a unique approach to addressing two significant concerns for children: dire literacy needs and mounting health issues. These issues are inextricably tied together because children need to acquire good writing, listening, and communication skills in order to understand and appropriately use health information during their lifetimes. As of Fall 2018, Marian has since overseen the program in 32 schools that have published more than 450 newspaper editions. Fall 2003—First newspaper, Hillcrest Healthy Times, is published at Hillcrest Elementary School, Upper Darby School District. Fall 2006—Healthy Times begins expansion as a pilot program of The Food Trust. Summer 2009—Student reporters cover the Centers for Disease Control and Prevention’s Weight of the Nation conference in Washington, D.C.
Fall 2009—Student journalists cover the American Public Health Association annual meeting in Philadelphia. Summer 2010—Program is renamed Healthy NewsWorks and joins New Beginnings Nonprofit Incubator at Resources for Human Development. Spring 2012—Healthy NewsWorks student journalists publish first book, Leading Healthy Change In Our Communities 2012. Winter 2013—Healthy NewsWorks launches prescription drug safety program in schools, supported by grant from the American Medical Association Foundation. 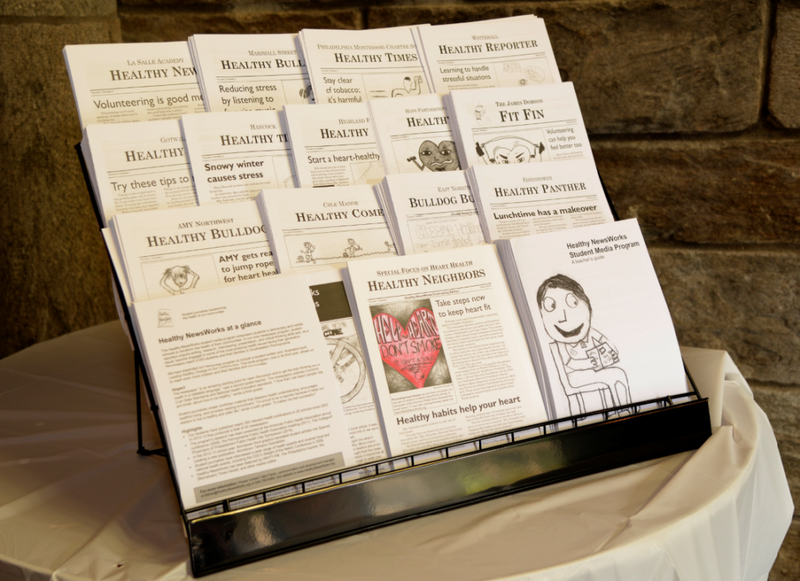 Spring 2014–Healthy NewsWorks publishes its first community edition, Healthy Neighbors, focused on heart health, with stories and illustrations from student health newspapers. Spring 2015–Quest Diagnostics features Healthy NewsWorks students in its annual corporate social responsibility report. Fall 2015–Updated our Teacher Resource Guide to align with Common Core Standards. Spring 2016–Create peer-to-peer videos on handwashing and Ebola that were shown to students in Sierra Leone, West Africa. Spring 2016–Recipient of a public health award from the College of Physicians of Philadelphia, one of the nation’s oldest professional medical associations. Fall 2016–Recipient of a 3-year capacity-building grant from The Grace S. and W. Linton Nelson Foundation. August 2017–IRS approved Healthy NewsWorks’ application to become an independent 501(c)(3) nonprofit. October 2017–Our Hearty Kids initiative, promoting heart health awareness for students in kindergarten through second grade, is launched. March 2018—Healthy NewsWorks graduates from New Beginnings Nonprofit Incubator and begins operations as an independent nonprofit organization.